The Interstate 11 Tier 1 Environmental Impact Statement is following a process outlined by the National Environmental Policy Act, or NEPA, which is illustrated in the EIS Process graphic below. The process is designed to ensure that reasonable transportation alternatives are considered, that community input and involvement play a key role, and that the environmental and community effects are fully disclosed. A Notice of Intent (NOI) to prepare a Tier 1 EIS was published in the Federal Register on May 20, 2016. A copy of the NOI is available on the Documents page. General information regarding the proposed action was shared, along with notification of the scoping process and related meetings and input opportunities. As part of the NOI, FHWA and ADOT invited all interested individuals, organizations, public agencies, stakeholders and Native American tribes to comment on the scope of the Tier 1 EIS, including the Purpose and Need, alternatives to be studied, impacts to be evaluated, and evaluation methods to be used. The formal scoping period spanned 45 days from the publication of the NOI through July 8, 2016. Potential issues, opportunities and concerns were solicited from various agencies, the community and others to understand the scope of topics to address during the study. Scoping activities included nine agency and public meetings across the I-11 study area, combined with an online survey and solicitation of comments via mail, email and telephone for those unable to attend the scoping meetings in person. The online survey requested the same information as the comment form distributed at the meetings. Comments were welcomed at any point in the process, but only those submitted through the end of the scoping period (July 8, 2016) were integrated into the Scoping Summary Report as formal documentation of community issues, opportunities and concerns. A copy of the Scoping Summary Report is included on the Documents page. Following scoping, a wide range of corridor alternatives were developed. Various corridor options were screened using criteria consisting of multiple quantitative and qualitative measures that correspond with the Purpose and Need; public, agency and tribal input; as well as additional planning-related factors, such as potential impacts to sensitive environmental resources. The screening enabled FHWA and ADOT to refine and further consider corridor alternatives that best meet the overall Purpose and Need of the I-11 Corridor, as well eliminate corridor options that do not adequately meet the Purpose and Need. The screening process yielded a reasonable range of corridor alternatives, along with a No-Build Alternative – or do-nothing scenario – to advance into the Tier 1 EIS phase for more detailed study. The Alternatives Selection Report that documents the alternatives evaluation process and results is available on the Documents page of this website. The Draft Tier 1 EIS is an official report issued during the NEPA process that documents the detailed analysis of the alternatives. The results of this analysis identify a 2,000- foot-wide Recommended Alternative. The Draft Tier 1 EIS document is available on the documents page and is being circulated for public and agency review and comment from April 5, 2019 through May 31, 2019. During this time, public hearings are being held to present the information and encourage formal comments. Comments are accepted via the I-11 study website, email, mail, telephone, and at the public hearings. Ways to comment, locations for viewing the Draft Tier 1 EIS document, and public hearing dates are included on the Public Meetings and Outreach page. 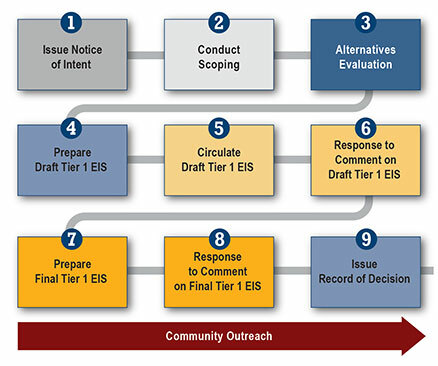 After the Draft Tier 1 EIS public and agency review and comment period ends on May 31, 2019, the project team will consider all comments received, and conduct additional analysis and coordinate with stakeholders as needed to identify a Preferred Alternative in the Final Tier 1 EIS. The Final Tier 1 EIS will also document and provide responses to all comments received during the Draft Tier 1 EIS public comment period. The Final Tier 1 EIS will be made available online on the Documents page. It is important to note that the Preferred Alternative could be the No-Build Alternative. If FHWA and ADOT select a Build Corridor Alternative, it would be implemented and constructed in smaller segments as funding is available. The Final Tier 1 EIS will provide a phased implementation plan, which is the framework for how the 280-mile corridor would move forward into Tier 2 studies. The Final Tier 1 EIS will be made available for a minimum 30-day public review period. The document will be made available online on the Documents page. ADOT and FHWA will complete the environmental review process with preparation of a Record of Decision (ROD). The ROD will confirm the Selected Alternative (Build Corridor Alternative or No-Build); present the basis for the decision; describe the alternatives considered; and provide strategies to avoid, minimize or compensate for environmental impacts. As the federal lead agency under NEPA, the FHWA would ultimately approve the ROD. The ROD will be made available online on the Documents page. A continuous and comprehensive public involvement and outreach process has been integrated into every step of the project to provide community members, businesses, the traveling public, local governments, tribal governments, stakeholders, and other interested parties with multiple opportunities for meaningful participation in the study process. Public meeting information is provided on the Public Meetings and Outreach page. Comments are accepted at any time during the study process. To learn more, visit the Contact Us page.